Decadent Imperial IPA | Ska Brewing Co. 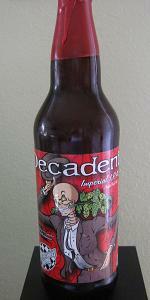 Decadent has a fruity, floral hoppy nose. Pours gold with a slight haze under a fluffy off-white 2” foam cap. A big fruity malty attack combines yeast and hop driven fruit flavors such as papaya and melon with light caramel malt and light grains to finish with a clean, bitter aftertaste with a hint of light vegetal hop flavors. The beer contains a lot of hops but they are expressed more in the flavor than in the bitterness. Well balanced. The beer has a big body with slightly below carbonation. Decadent Imperial IPA. 10% alcohol content. Bottle shows a skeleton in a suit an hat dancing around with a bouquet of hop in his teeth... delightfully evil. A- The beer pours deep hazy orange tainted fluid with tight bubbly head that leaves behind a nice quater inch head and froth. Lacing is top notch with gobs of excess froth clinging to the glass. S- Smell is of sweet floral hops with a kinda danky twang of malty alcohol in the back end. T-M- Well... not what I expected from the smell but starts with rotton citrus flavor consisting of grapefruit, star fruit and orange. May be some grassy and earthy tang in there. Decent malt back bone keeps this one alive, but all and all unbalanced. Mouthfeel is thin with a dose of acidic tingle with the carbonation going down. D- Yeah its drinkable but not my first choice. Needs more balance between the hops and malt but hell, a decent showing of DIPA. Good Lord. What a let-down. Almost no hop aroma. Thin bone-white head that seems to have the way of the aroma. Not really carbonated to a suffecient level. A slight dried fruit flavour on the first sip quickly rots through the alcohol dominated mid-palate. I really don't see what can be so interesting about this guy. Thie 10% is not well hidden at all, in fact it's the white elephant in the room with all the other elements turning a blind eye. This beer tastes cheap. The beer claims a rather high IBU level, not evident with no earthy or sprucy hop notes. The second time I tasted this beer was worse than the first, b/c I was expecting it this time. Again from a bottle, different place, different batch. Still crumby. Why Ska? Why? A-Amber/copper with a thin white head that leaves very little lacing. S-Hoppy (citrus), sweet and boozy. It smells more like an American Barleywine. T-Sweet, boozy, caramel, raisins, with some citrus hops. Again it tastes more like a barleywine than a double ipa. D-Though its not hoppy enough its still delicious and very drinkable. Loved Modus Hoperandi so jumped at the chance to get this. Pours a light amber color, mostly clear. Small off-white head that dissipates fairly quickly but leaves some scattered lacing. Malt and hops in the aroma, not sure which is more prominent. The malt is caramel and sweet. The hops are grapefruit and other citrus. But, it's just a touch below other really good DIPAs I've had. Similar tastes to the aroma. The hops taste a little more bitter in the flavor than the aroma would suggest. In this pour, the malt seems stronger than the hops, so overall it ends up a touch sweet for me for this style. The mouthfeel is spot-on for the style. Just a little less favorable mix of flavors and aromas than the other top DIPAs I've had. Picked this up while on a visit to the Phoenix area. It had my two favorite things on the bottle (Ska and Imperial IPA) so let's give this a whirl! A: A somewhat clear amber orange color that doesn't pour much of a head and leaves only a scant bit of lacing around the glass. Nothing special here. S: Very malty for an Imperial, has an almost bubblegum or candy type of smell, not really like a Belgian but definitely candy scents. There is an ever so small scent of a citrusy hop but it definitely isn't the main player. Can't say it's a bad smell but it definitely doesn't remind me of what you'd typically smell from this style. T: Ok definitely more of a taste for this style than the smell, however it is still very different tasting. Let's see starts out with a nice bitter hop taste with a nice citric overtone, that then leads way to a very doughy malty aftertaste. Interesting take on the style, can't say it's my favorite but I do like it. One after thought it does hide the abv quite well. MF: Just about spot on for what I enjoy in this style. No complaints here. D: Pretty good, the abv puts it down ever so slightly but definitely a tasty beer that isn't too over the top like most of these are. Glad I picked one of these up. Decent enough, but nothing special. I'm a hophead, and this simply isn't enough for a high mark for me. The ABV and packaging are a nice touch, admittedly. Overall, it is a well balanced beer, but I prefer less balance and more hops. Poured from a wax sealed bomber. Has a deep amber color with little head and no lacing. The first thing I smell is malt. The second thing I smell is malt and a hint of alcohol. And well the taste, you might have figured that one out already. Oh yes. Malt. The hops are there, I can tell more from the mouthfeel however then the taste. The hops come through finally in the aftertaste once the malt subsides. The mouthfeel is thick and syrupy but has that slighly puckering, lip smacking sensation you get form high IBUs. I was a bit surprised given the style, it was not what I expected. I'm not sure if this might be better classified as another style, but Imperial IPA is what the brewers were going for and so it should be reviewed as one. I'm not sure they hit the mark, but otherwise this beer stands up on its own and is one to be reckoned with. If you are looking for a hop heavy IPA, I would look elsewhere, but for something different with a heavy malt nose and flavor (not unpleasant in the least), this beer is definitely worth a try. 22-oz bottle with wax seal. Pours a deep copper but it took an very aggressive pour to get a decent medium tan head. head Left the amount of lacing on the glass you would expect from this style of beer. The mouthfeel is pretty good for this style. Carbonation is moderate. It starts malty sweet then starts to move towards hoppiness and finally finishes hoppy. The finish is where in start to notice the 10% alcohol. Not to pronounced but it's there. It's not an overly bitter finish. I found this to be a very drinkable beer. Beautiful color. Copperish. Orange/red. Soft, creamy head. Almost sticky looking. Strong hop aromas. Sharp, nose hair tingling. Decent sharpness of alcohol there. Pretty heavy on the florals but has some sweetness. Aftertaste is not overly bitter at all. The more this beer warmed, the more I enjoyed it. Not sure if that’s something about the flavors or maybe my palate just adjusting, but it’s pretty damn good. I liked it. Especially for $5.75 at my local Specs. Decadent Imperial IPA from Ska Brewing Co.